Maybe I am a bit rough, but very few of the units I have used for storing and carrying around my fishing tackle have survived more than a year or two of the abuse heaped upon them by the combination of their owner’s indifference to their wellbeing, and the harsh marine environment. Smashed plastic, busted catches and corroded zips have seen off, in the medium term, pretty much every tackle storage system I have ever used in the past. In mid 2004, however, Black Magic Tackle introduced their Tackle Pack to New Zealand. Solidly made from a heavy water-resistant polyester material with a waterproof plastic base and stabilising feet, importantly, all the zips and fittings were made from nylon and derlin plastic. 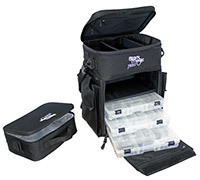 There are a wide range of alternatives for tackle storage, which can accommodate up to seven plastic utility boxes of two different sizes, as well as side pockets, top hatch compartment and internal zip pockets. The whole unit is stiffened, padded, and solidly built. I quickly acquired one and it has been a front line piece of kit ever since, accompanying me on many of my fishing trips around New Zealand. So, today, seven years since I wrote the original review on my Tackle Pack (November 2004), how has it fared? It is not often you get the opportunity to look at the performance of a piece of fishing equipment with this length of perspective. Most fishing gear will have either died the death or been long superseded after this length of time. Systems have a way of refining themselves, and I find that the Tackle Pack allows me to carry much of what I need to face bread-and-butter saltwater fishing tasks in this country, with the occasional switching out of utility boxes containing specialist gear. In seven years, I have never washed or cleaned the Tackle Pack itself, although the internal boxes get a spruce up from time to time. The pack spends a lot of time out in the elements of course, and gets rained on from time to time, but that is about it. The UV rays have bleached the original jet black colour to a dark copper, but that is about the only sign of wear. Not a stitch has come unravelled despite me sometimes forcing extra gear into it to side-bulging levels. The pack straps are still solidly attached, although heavy loads of jigs and lead sinkers are common. And most importantly, after years of abuse, the derlin plastic zips are still hanging in there. These are not cheap items for the manufacturer, but are critical to the Pack’s longevity. What more can I say; the Tackle Pack suits many of my needs perfectly; it has never let water into the internal boxes despite sitting out on boat’s back decks in heavy weather for days, and with no TLC at all is still going strong after seven years of heavy use. All my mates have them (or smaller brother the Tackle Bag) too; to the extent it can be difficult to tell which bag is yours when away on a multi-day charter. When I mentioned I was going to write this piece, all of my co-workers at Fishing News added their own unsolicited endorsements of my own experience. This is a great piece of kit.